I was looking for a snack to make for the kids for Sunday afternoon and came across baked churros at The Baker Chick (rather than the ones which are traditionally fried). Hey, brilliant idea, hubby loves churros but I hate frying stuff, so this looks like a great recipe to try. 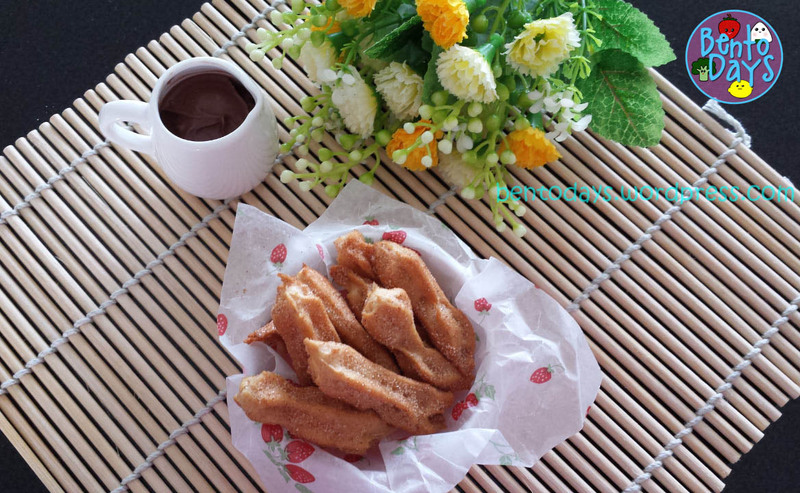 This churros I made uses the choux pastry recipe (pate a choux) from Steamy Kitchen. Specifically, I used 250 ml water, 125grams butter, 150 grams sifted flour and 4 small eggs. 1. Preheat oven to 185 Celsius. In a medium pot, bring the water and butter to a simmer on medium heat. Remove from heat and add all the flour and stir rapidly with a wooden spatula. 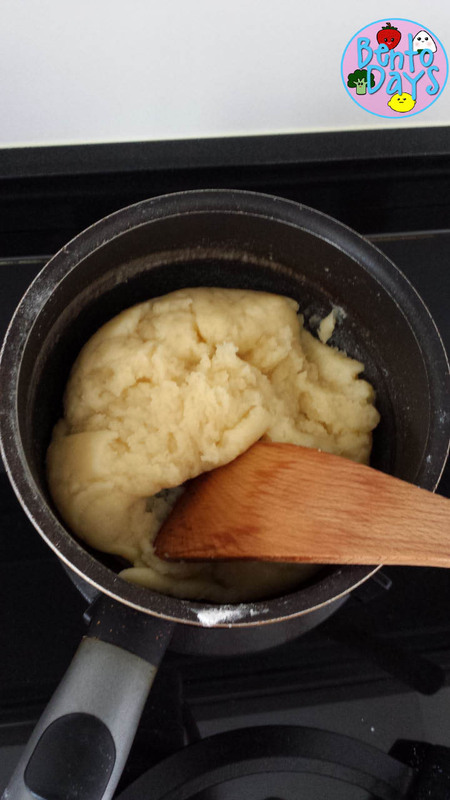 The flour will start absorbing the liquid and dough will form. Return to heat and keep stirring to continue cooking the flour and cook off some of the water, another minute or two. I took them off the stove when the dough does not stick to the sides of the pot or wooden spatula. 2. Transfer the mixture to a mixing bowl and cool for 5 minutes. (I actually sat the mixing bowl in a basin of ice water to cool it faster). 3. Add the salt and the eggs one at a time mixing rapidly until each is combined into the paste. The paste will go from shiny to sticky as each egg is incorporated. The dough is ready for piping at this point. 4. I used a star shaped nozzle fitted into the cut tip of a piping bag. I don’t have a large piping tip at home, but I already intended to make bite sized baked churros instead of the long ones so I guess this was Ok. I piped one inch lines on baking parchment. 5. Bake at 185 Celcius for 15 minutes, then reduce the temperature to 165 Celsius and bake for another 25 minutes. Do modify the amount of time depending on how fast your oven heats up, as a general rule I turned down the temperature once I noticed the tips of the churros starting to brown slightly, and I baked at the lower temperature until the churros were all golden brown. If your churros are bigger in size, the baking time should be increased by another 5-8 minutes, the key is to bake til they are golden brown to ensure the centres are cooked through. As mine are quite thin and bite sized, these cooked through faster and I had no issues with undercooked centres. 6. Roll the churros in cinnamon sugar to coat while they are still hot. (If you wait til they have cooled I guess the cinnamon sugar would not adhere as well). PS – these are a WINNER. The kids loved it and ate every batch even before they were completely cooled. I had to put away the last batch else they would have eaten that instead of dinner. I love churros and I hate frying, too!!! Fabulous! Love these – love them….takes me right back to happy days in Zaragossa and Granada! Thank you for dropping by my blog! Glad you enjoyed these! 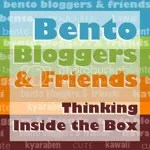 For bento classes, please register your interest here.